removed when State Highway 32 is expanded. Blice Edwards of Indianapolis was contracted to complete the unique project a􏰃er being selected through a design compe􏰀􏰀on judged by the Grand Junc􏰀on Task Group. The mural was unveiled during Wes􏰁ield Rocks the 4th in July of 2011. This Colorful Bakery in Lebanon Indiana used to be a drab looking gray cinder block building. Locally known for their doughnuts, they were not recognizable as a bakery. This makeover made the business an instant talk of the town and boosted sales to the point of opening a second location. This Mural painted on canvas was cut out and applied to the wall of the new Titus Bakery location’s, party room. Located in Westfield Indiana, we created colorful imagery that represents the town and the bakery! The Town Council Of Tiny Merom Indiana Wanted To Preserve The Town’s Vibrant History. An Instrumental Couple In The Town Made It Happen By Contacting Blice Edwards. We Worked For A Year To Secure Funding, Location And Subject Matter Of Their Vision. Initially We Discussed Painting The Mural On The Side Of One Of The Few Remaining Buildings Of The Original Town. It Was Determined That The Building Was In Such Bad Shape That “Building A Wall” Was The Thing To Do. This 15’X45’ Cinder Block Wall Was Built Especially For The Mural Project. It Sits In A Prime Location Leading Up To “The Bluff Park” The Park Has Been A Place To Watch Spectacular Sunsets For Literally Hundreds Of Years. On The Indiana/Illinois Border It Faces The West And Overlooks The Flat Lands Of Illinois. The Original Livery Stable Is Actually In The Background, Thank You Bob And Nancy!!! This Is An Image That No Longer Exists….This Three Dimensional Mural Promoted The Arts And Theatre District Of Mass Ave. It Was Taken Down In 2015. 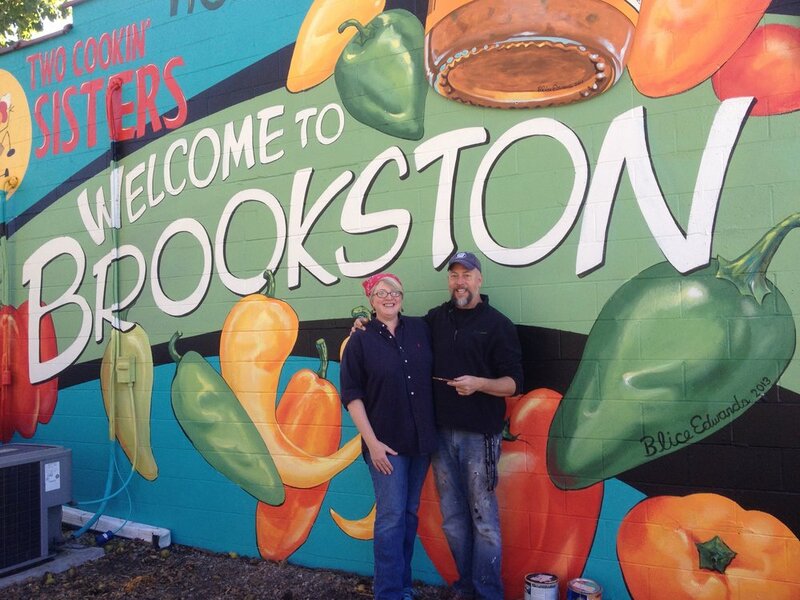 Kim and Jon after the completion of her new mural. It’s a public welcome to this whisper of a town, and a billboard for her business. What a delightful client. So nice feeding us lunch every day! they have theBest sweet Salsa in indiana! This was a clever way to camouflage the ugly and dirty trash dumpster that must sit in front of out beautiful welcome mural, :What ugly dumpster” you ask…. it’s the grate of fruit! Looking at the faded signage painted on this building was a Challenge. only a shadow of once painted billboards remained. With an enhanced photo of the wall We could make out that there were several different signs. In the main sign, a large letter “Q” and most of the word ”Quaker” was visible there was debate about weather it was Quaker oil or Quaker Oats. We looked up some of the former business that were housed in this very building and imagined what their signs might have looked like. in the basement of this building was found, an old coffee can from the FFF Coffee company, an actual indianapolis business. The label was Still in tack! it inspired us to include their exact label in our design. Walker Candy factory, Stocker Drugstore and Henry’s bee keeping supplies were also business in this building. it was a privilege to revive a small piece of history and pay homage to the Art of the “Wall Dogs”, who painted the original signs.